Today, public relations success (or failure) is defined as much by the trending Tweet, Facebook opinion, YouTube video, blog post or Google comment as what showed up in a newspaper article, radio report or TV program. We’ve served Fortune 100 companies, manufacturers, state government agencies, healthcare payers, history-focused organizations, schools and not-for-profits. Regardless of the channel, it all begins with integrity, transparency, strategy…and great content. We can help you develop and implement a plan that incorporates traditional, digital and social media, SEO, measurement and analytics. Is your program already underway? Do you need PR and content marketing pros for targeted support? We welcome the opportunity to work in your team’s sandbox. Send us an email or give us a call at 800-328-0212. 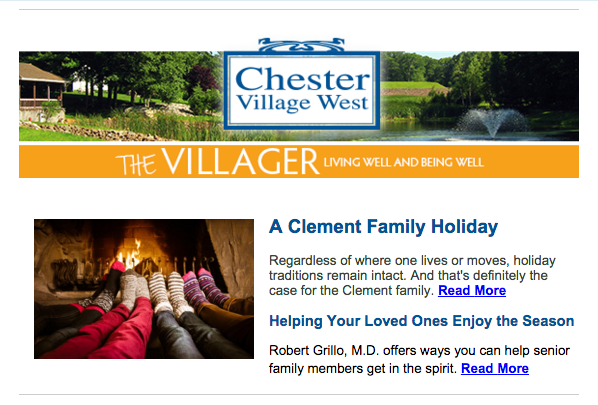 Chester Village West, Chester, Conn.
To connect this active seniors community with prospective residents and their adult children, Acuity PR provides Chester Village West with media relations, community outreach, story development, event coordination, email marketing and social media support. We share the lives of the community’s engaged residents and its full scope of healthy living and lifelong learning programs. We’ve achieved a consistent 30+ percent open rate and 25 percent click-through rate for the monthly e-newsletter by mixing actionable advice with compelling “I-see-me” stories and images. 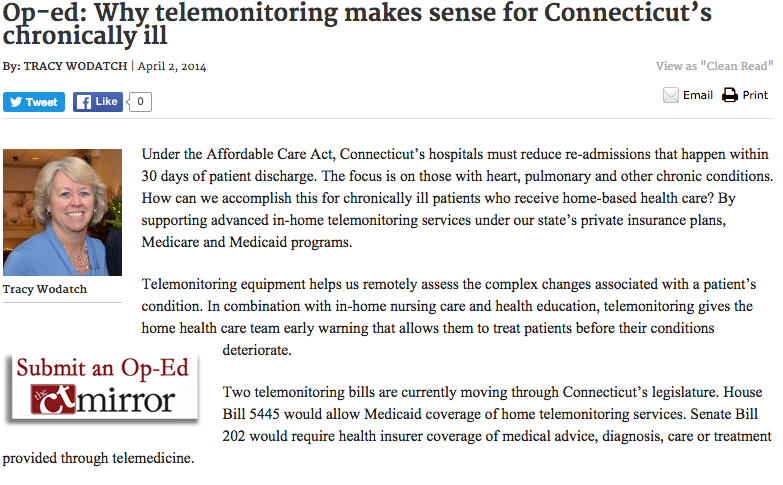 Connecticut Association for Healthcare at Home, Wallingford, Conn.
Acuity PR helped position Connecticut’s largest home care industry association with the state’s legislators, agency members and homecare advocates through a focused PR, content marketing and social media campaign. Case studies, opinion pieces, blogs, and daily engagement on Twitter helped the organization rally support for policies to expand access to home healthcare. Daniel Penn Associates LLC, Hartford Conn. In collaboration with Mad Communications, we support this management consulting firm’s web site content and email marketing program. Acuity PR provides strategic marketing counsel, writing, editing and media outreach for case studies and blog posts shared on the company’s Twitter and LinkedIn feeds and syndicated with leading publications such as IndustryWeek, Plant Engineering and Consulting-Specifying Engineer. To position this app-based on-demand ride company’s professional, flexible, safe and budget-friendly services with business clients in New York City and London, Gett retained Acuity PR to develop blog posts and Q&A pieces that differentiate its philosophy from the competition. Interviews with Gett drivers, managers and leaders on both sides of The Pond reveal the company’s heart and commitment. Hartford Public Library, Hartford, Conn. This respected public library wanted to gauge how the hplct.org web site is serving its customers’ needs. To inform strategies that could improve the site’s look, feel and navigation, Hartford Public Library engaged Acuity PR to collect feedback through a tailored web-based survey, live site reviews with library visitors, focus groups and a best web practices survey of top U.S. libraries. Our report and recommendations helped the library make initial changes to the web site’s content and navigation. It also guides future iterations. 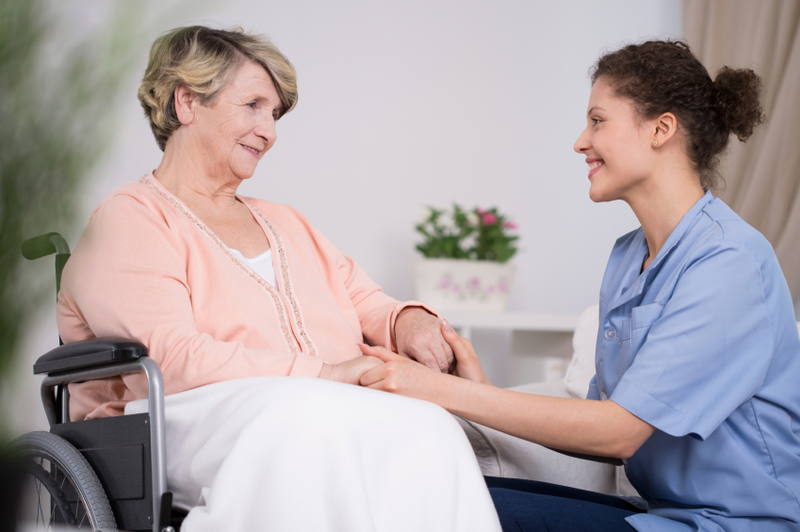 We provide content marketing and media support to iNeedHomecareNow.com, a startup web- and app-based provider of homecare resources. Social and traditional media outreach, blog posts, position papers and consumer events help us reach family caregivers who juggle their lives with their elderly loved ones’ needs. We’re proud to collaborate with these respected marketers. And we also like hanging out with them! First Experience Communications, Glastonbury, Conn.
Blog development, web site content development and media outreach for Best of Care Inc. The Pita Group, Rocky Hill, Conn. Content development (blogs, point of view pieces) and trade media relations for ebm-papst Inc. Web site strategy, social media strategy, content marketing, analytics. We want more young people to have a limitless future in science, technology, math and engineering. That’s why we support these programs.